We’ve launched a seven month drive to provide instruments for the kids of the Seven Mile Music program. 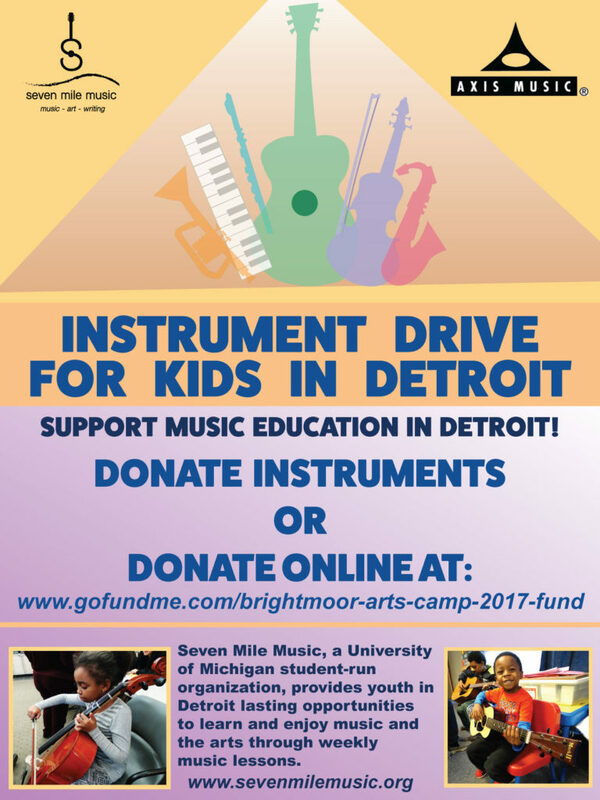 Seven Mile Music is a University of Michigan student-run organization that provides free weekly music and arts lessons to K-12 youth in the city of Detroit. Axis discovered Seven Mile Music on Instagram and reached out to find out how we can contribute to a great cause. Seven Mile responded with a request for more instruments for their kids. The result is an instrument drive that began in March and will go through the end of 2017. Axis will be promoting the drive inside both academies and on social media as well, including giving incentives to current students for donations. Anyone interested in contributing to the cause can stop by either Axis Music Academy or call to arrange for a pick up. The donated instruments will be fine tuned by Axis instructors before being turned over to the Seven Mile Music program. Throughout the school year, Seven Mile Music visits various locations in Brightmoor to teach free music lessons. Seven Mile Music teachers travel on Wednesdays to Murphy Performance Academy, a charter school at 23901 Fenkell street, and on Fridays to Mission: City, a community center at 20405 Schoolcraft. Instruction is provided by student volunteers from the University of Michigan, all instruments are provided by Seven Mile Music, and the program is completely free for the children.